We are clearly experiencing some interesting weather at the moment. Hot one day and raining the next! Such extremes make planning runs and events very challenging. So, given this fact, it was certainly wise to cancel the Australia Day Run with the 40 degree forecast – it was a very hot Australia Day long weekend all up. I know many of you were looking forward to the longer Australia Day Run taking place on some quiet and peaceful back country roads of the southern vales area. Your Committee will certainly try and look for available spaces in our events list where we can re-schedule this event. Looking forward to when we can next get our veteran vehicles out on the roads again, our Rally Master – Phil Keane, has organised a run to West Beach for this coming weekend. Let’s hope the weather is a lot kinder for this event. If it isn’t, as a general reminder, I would like to draw to your attention our long standing view that the cancelling of any VCCSA event – when the weather reaches extremes of heat(or when there is a ‘catastrophic fire danger’ warning issued) – will continue to be our clubs position where the temperature is forecast to be 36 degrees or above. Andrew Hayes, our Mannum Rally Director, and his group of assistants are very pleased with the number of reservations placed at both the Mannum Motel and the Caravan Park. If these numbers are accurate, we could be looking at a very sizable contingent of participants. There are some vehicles coming from interstate and also some participants joining us with their veteran motors from various other clubs within SA. It is great to see the enthusiasm for such an event after coming of the back of the TAVCCA National Veteran Rally in Clare. 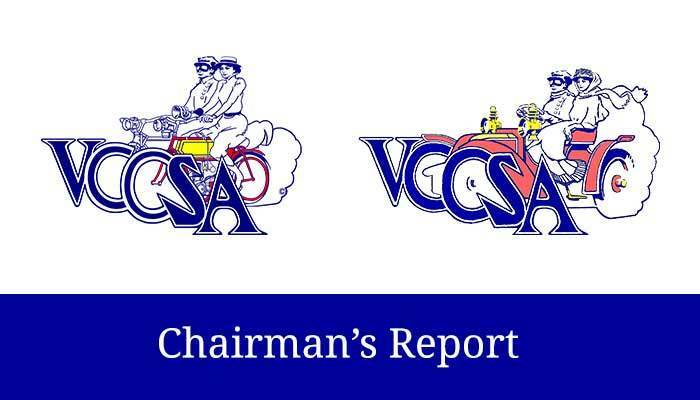 I think the VCCSA and it’s members should be extremely proud of the response and also the organisation of this event as it builds on the established credibility of past weekend rally directors. It is also an opportunity for our club to highlight its purpose of preserving veteran vehicles (regardless of which club) and to offer back to those with links to the early rural motoring communities of SA a chance to enjoy and celebrate the work that we undertake to keep them active and one the roads! 1) As many are aware, both the Motel and Caravan Park have now opened up their booking to the general public. 2) To help the volunteers organising the Rally, can you please forward your Registration Form ASAP. We have had to move the due date for this forward to the 1stof March so final preparations can be made. 3) There is a limit of 70 people at the Saturday night rally dinner – accommodation reservations suggest we could have more people than available seats. Therefore, a place at the dinner will be made available based on the order of when you return your registration form. So please, send them in quickly. Please include thewordRALLY and your NAMEas payment reference. I look forward to meeting many of you again this week at our first Members Gathering for 2018.